Ahobilam. In the Nallamala Forest Range in the Kurnool district of Andhra Pradesh, rests a series of temples dedicated to the One who took the shape of a Lion-Man once, for his subject called upon him when his faith was at risk and the consequences could have been dire. That One came blessing the little kid and freed him of the tortures by his close one who was blessed with powers nobody else could flaunt. Such powers the Asura Hiranyakashipu possessed according to the mythology. He thus assumed to be the lord himself and followed torture, barbarism and cruelty under his rule. Lord Narsimha, the One then came upon the call of little Prahlada, son of the Asura himself and relieved this Earth of him despite maintaining the blessings he had been bestowed. Hiranyakashipu was killed by this Lion-Man by his bare nails at dusk at the door frame holding him in his lap. 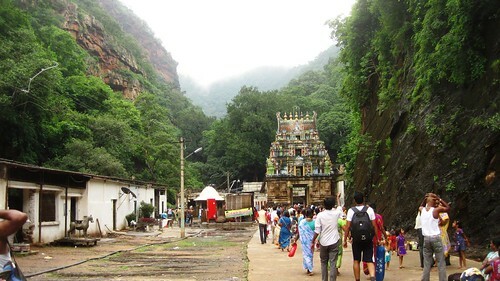 Ugra Stambha at Ahobilam is said to be the place where Lord Narsimha gave his appearance. At Jwala Narsimha temple, he got most furious and killed the Asura. He appears with his consort Lakshmi in Kroda temple and he is graceful at Malola, his different moods are depicted in Nav Narsimha temples. 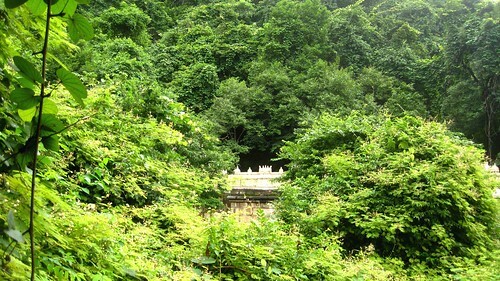 At the Lower Ahobilam lies one shrine and 4 of the 9 Narsimha temples are accessible by road here. 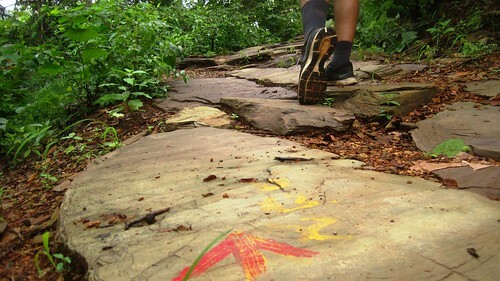 The other 5 are located ahead of Upper Ahobilam, in the forest where no shops whatsoever are available. 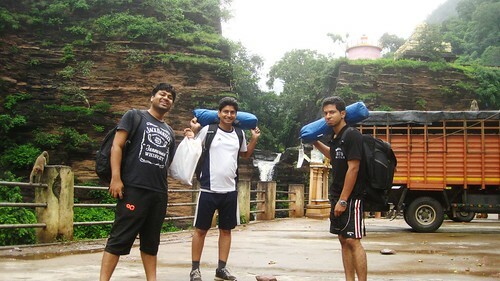 The total trekking distance covering all the temples comes close to 32 kms. One does not camp in Ahobilam for it gets spooky, might as well dangerous. The trees in Ahobilam area are so tall that the sunlight struggles to find its way down. 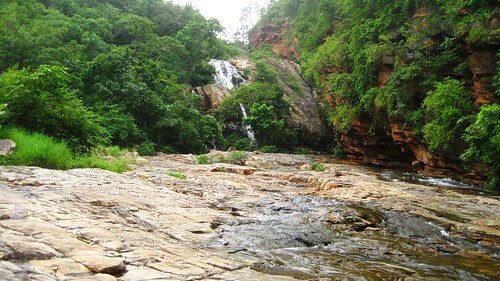 The forest is much dense, and there come many waterfalls along the way. Old ladies use the carriage option where people carry them to complete the whole journey. 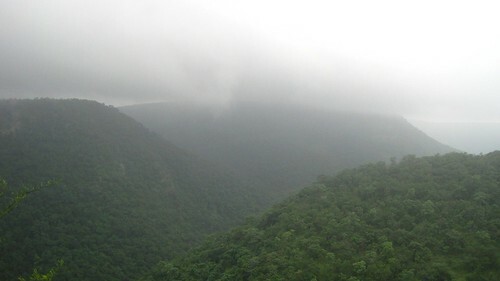 The trek to Ugra Stambha gets very steep and tough and also is the only place where you get mobile reception once you are on the top of the mountain. And… I did not know most of the above when we left for there. I love the element of surprise in my trips and so I opt for it. Just the keywords Trek and Nature had me drawn. 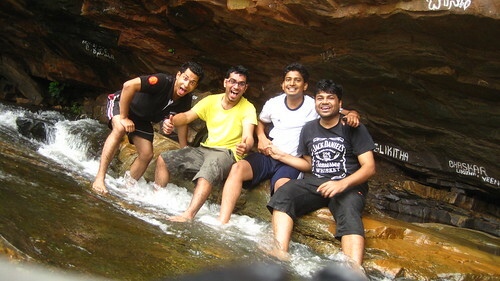 And… my friends who trusted me with the whole planning of the trip knew nothing of anything! And… that is how it was the most awesome trip of 2014. 3 of my friends and I were on the bus a Friday night headed to Nandyal (40 kms from Ahobilam) when everybody got just a hint of what we were in for when I handed over a printout briefing about the temples, a vague map and some details. At morning 5, we were on a different bus to Ahobilam and already in awe when the bus pulled up at Upper Ahobilam. There were mountains in sight, a small waterfall and many monkeys and people. We handled our priorities, had our breakfast and asked for the first time to the local shop guy, “What’s the scene?” We acquired the knowledge that post this shop we do not get any other for it’s all forest-y. We were carrying some snacks but now it hit us that those snacks will be all our food for that day and the next till we come down. We bought some more food, loaded our camps on our shoulders and started. 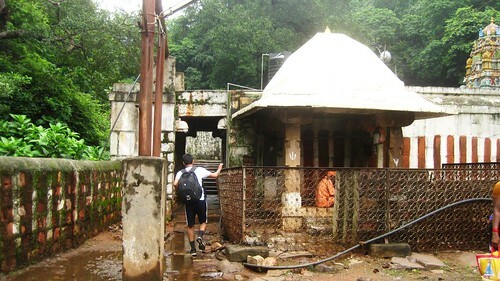 At first we visited Upper Ahobilam temple and paid our respects. I have observed that a lot of architectural style revolves around pillars and is common in temples of Warangal, Hampi and many other places in South India. Coming out from Upper Ahobilam and going further, it appeared as if the gates of wilderness had opened for us and we have been ported to a new land altogether. First off the waterfalls came and then, the stairs. They just kept on going, took a turn and kept going. Gopal sir looked at the stairs and then at me, I had already taken a lead to save myself getting slaughtered from him. Many such instances presented themselves over the next 2 days and I somehow arrived in one piece at home. Hail Gopal sir! Next up was the Malola temple and then Prahlad Betika, a temple dedicated to little kid Prahlad and it’s said that he learned Vedas there. A small but rapid stream flowed next to a rocky platform where we sat for some selfies. There was hardly any crowd at the time and we stumbled upon another waterfall. How could we miss the shower?! Oh, how refreshing it was! And then came out the flute. We sat around on the boulders where waterfalls crashed not very far from us and overlooked a beautiful valley and the mountains afar, listening to Prateek playing on his flute, which he carried for just such instances. It was calm and very soothing. -Visit my FB Page here. Thank you so much Rahul. I always try to be unbiased about places, and not sell them, but this one, yes, it’s a must go! A good day to you too. Aho gr8 ! Lovely jungle – dense & green. Enjoy! Thank you sir, it was amazing. Wow Jatin. Your travel stories always make me wanderlust. Great post but where is Ahobilam? Oops, it’s in the Kurnool district, A.P., updated now. Thanks! 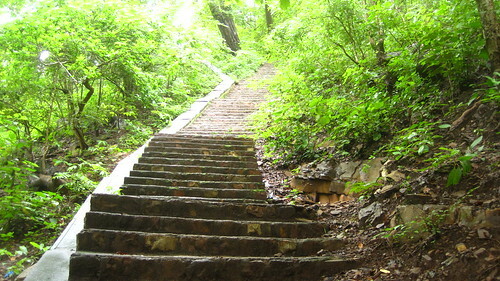 Dense forest, gushing waterfalls, trek that leads to ancient temples …what a refreshing trip! Totally! Thanks Moon for dropping by. This post has me thirsting for more!! I shall not keep you thirsty for long then!! Good to know about this temple. I wasn’t aware about it. I always thought that Lord Narsimha temple will be somewhere in North India. Glad that I got this info in your blog. Have you also planned any trip to other religious places? Bhai, Nice writeup. Did we take bus to Nandyal or Allagadda? Thanks bhai. Nandyal is the nearest town to Allagadda, which is a municipality, so Nandyal is easier to identify. We got down at Allagadda, but Nandyal came just before when we all were snoring, probably. Haha. Mythology, natural beauty and adventure. Great way to kick of the new year. Yeah, it was awesome! It happened in the last year itself, a lot many posts got spilled to this year due to my busy schedule. I am not a travel enthusiast Jatin, but the place looks lovely nestled in lush greens. And with the mythological bit attached to it, the trip must be memorable. So your friend plays a flute? Interesting. It was one of my best! Yeah, he does. 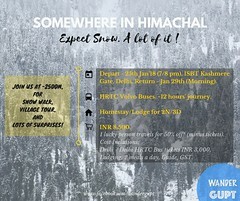 This one seems to be full of lots of adventure… The mythology attached to it came new to me..
Ahobilam is definitely the place to visit for nature, trek and history..